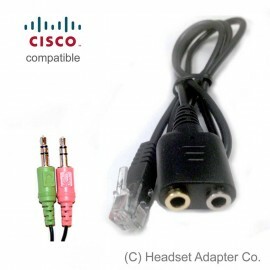 Do you wish to make your computer headset compatible with your Cisco phone? PC Headset Adapter is the solution. Headset Adapter for Cisco 7940 IP Phone allows you to use your computer headset with 3.5mm audio plugs with a Cisco office phone with RJ9 modular plug. This solution gives you great flexibility to choose a headset you like. For example, you can use chat headset that you may already use with your computer. Or purchase gaming headset that will block most outside noise. Or choose between behind-the-neck and boom-style headset. As far as the headset has an individual plugs for Headphone and Microphone, it's compatible with our adapter. And you still can use it with your computer or gaming console. You can connect external desktop speakers and external microphone, and use standard Cisco 7940 phone as a conference station. With Auto-Answer feature enabled, you may connect a "loud speaker" for overhead announcements.